Brattleboro, lies in the southeast corner of Vermont, just nine miles north of the Massachusetts border and directly across the Connecticut River from New Hampshire. The community developed in the 1760s, when European American settlers established homes in the river valley. Brattleboro was ideal for settlement because of its topography. The Whetstone Brook, which runs from the foothills of the Green Mountains through Brattleboro, provided a major source of waterpower, and the Connecticut River offered an ideal transportation route for sending finished products via flat-bottomed boat to market in southern New England and New York. 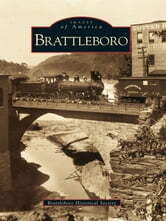 Brattleboro presents the story of its people, who from the beginning have exhibited and benefited from a positive philosophy toward life. In the mid-1800s, railroad service came to the area and Brattleboro developed as a center for commerce, health spas, and literary activities. Factories manufacturing organs, toys, and furniture thrived. Printing and publishing industries, as well as literary societies flourished. Hotels opened, and visitors arrived to do business or just to avail themselves of the town's many advantages. To this day, the area continues to enjoy a stable economy.